As you might have noticed on my Instagram I've just come back from Greece and while spending all day in the sun and in the sea was absolutely wonderful the elements soon take a toll on my skin. I was using my La Roche-Posay Anthelios XL Factor 50 BB cream on my face and that kept me fairly protected from the sun but my skin needed some hydration. Like I do on all holidays after a long day at the beach I'd head back to the hotel for a shower and then cover myself in Aloe Vera gel, it's just second nature to me to apply something moisturising after sun exposure. While the gel is great for my body it's just too heavy for the face. 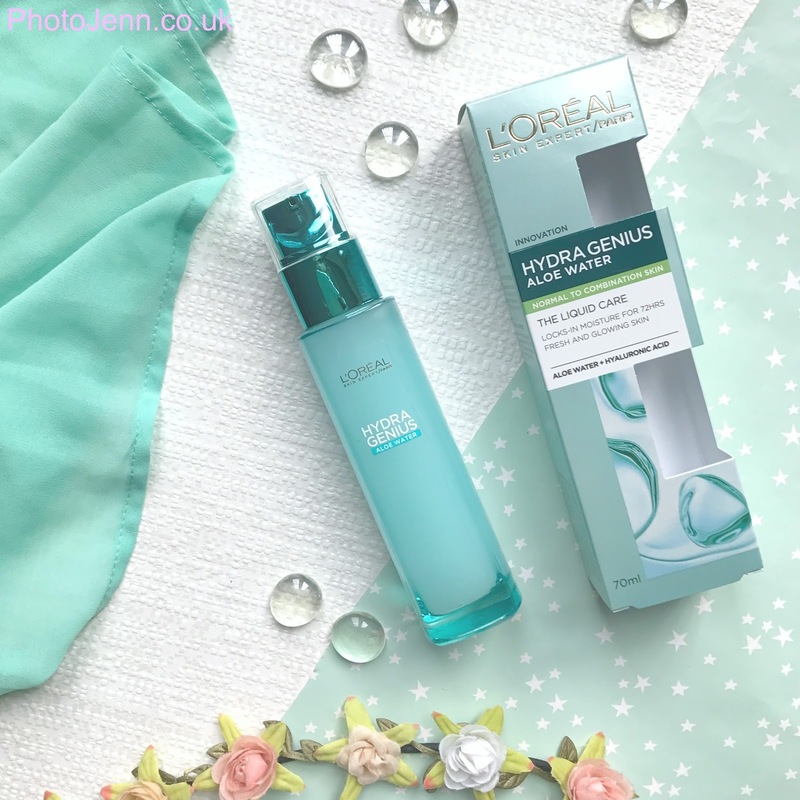 I picked up the L'Oreal Hydra Genius Aloe Water thinking it would be a great lighter alternative and perfect to use on hotter days where I don't want anything too heavy on my face. I admit I was originally sucked in by the packaging, I am all about the mint shades and the glass bottle makes it feel like a high end product even thought I bought it on offer in Boots for £6.66! Now don't let the name fool you, although it is 'Aloe Water' it has a slightly thicker consistency to what's inside our Evian bottles. It's almost like a lightweight serum, thicker than water, less thick than a moisturiser. One pump gives you enough product to cover the whole face - I've heard some people say they find it a bit tacky when they first apply it but I haven't found that's the case, I can only assume it's because they are applying a little more than they need to. As it is such a thin consistency a little goes a long way. It sinks into the skin quickly and leaves you with toned and hydrated skin. I've used it in place of my usual moisturiser in the morning and evening on my face and neck. We all know Aloe Vera is wonderful for the skin with it's anti-inflammatory properties. 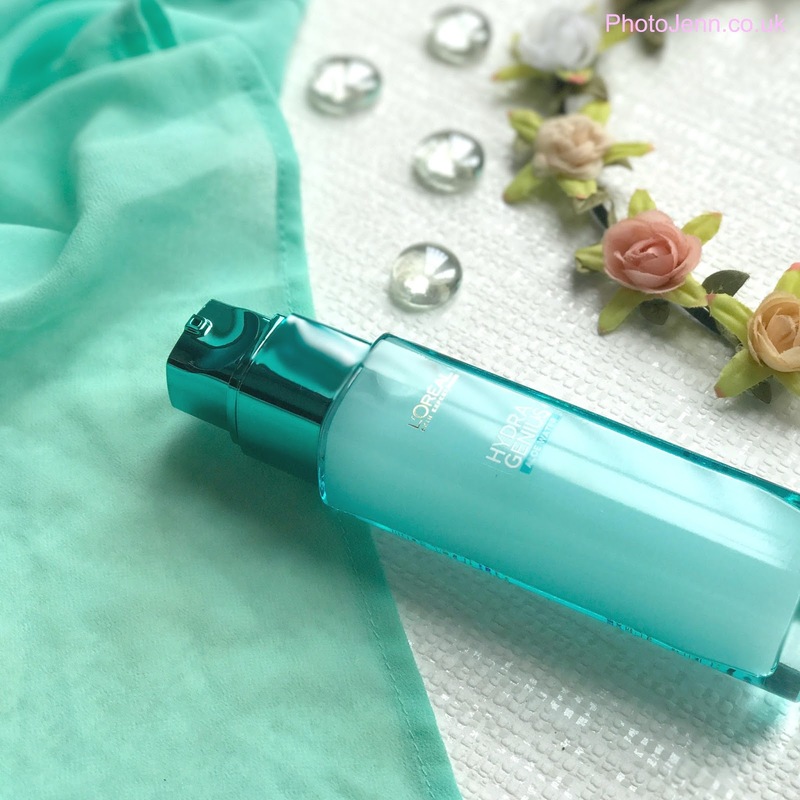 Another ingredient is Hyaluronic Acid which sounds scary but it helps to retain over 1000 times it's weight in water within the cells of the skin. It increases hydration, is great at repairing collagen and can improve the appearance of scarring too. 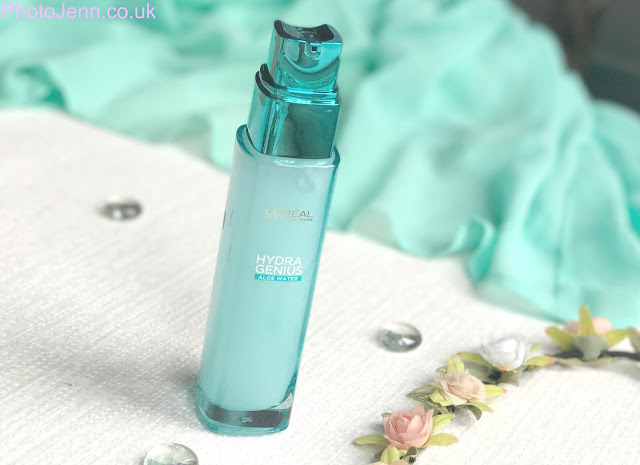 As Hydra Genius it is so light and absorbs to easily I've found it perfect to use under make-up as I can apply foundation almost instantly. So it's been perfect to continue use now that I'm at home. This 70ml bottle retails at £9.99 but I'm yet to see it sold at full price. Everywhere seems to have it on offer at the moment so it's the perfect excuse to pick one up. This sounds fab! Will definitely check it out as it sounds perfect for summer.